Quote: "A schoolbus caught fire outside Wisborough Primary School. Firefighters were called to Newpound Lane at 3.30pm today (Monday February 29)." Quote: "A loaded truck carrying motorcycles was completely gutted, its cargo of 57 mopeds badly damaged, and three cars parked nearby partially burnt as a fire broke out in the trailer truck in the New Karachi police limits early on Monday morning." Quote: "Without hesitating, he dashed into the burning truck and drove it over 100 metres away from the asphalt plant before jumping out of the burning vehicle in scenes that would make a script of an award-wining Hollywood action movie." Quote: "A barn and RV caught on fire overnight in West Knoxville. The fire occurred at 1:30 a.m. Monday. Firefighters responded to the scene near Third Drive." Quote: "A car has burst into flames on St Kilda Road in Melbourne. There are reports the parked vehicle exploded about 3pm." Quote: "Cranes one week. Cars the next. St Kilda Rd is the place to be if you like fire apparently! Poor Audi." 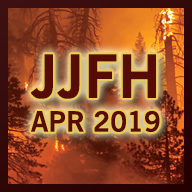 Quote: "The Oklahoma Forestry confirms that a fire broke out near West 201st Street and South 465th Street Monday Morning. The department says more than 900 acres have been burned. Oklahoma Forestry says they were called to assist with the fire early Monday morning." Quote: "Preliminary examinations, BirdLife said, showed that the seven vultures had died due to poisoning. 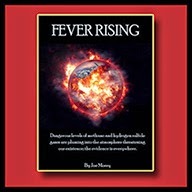 'The first possibility is death by primary poisoning, meaning the birds may have eaten poisoned bait, which is unlikely. The second possibility is death by secondary poisoning, meaning the birds have eaten an animal who had eaten something with poison (e.g. an animal who ate rodenticide). The third possibility is that the birds have eaten an animal which had been treated with non-steroid anti-inflammatory drugs (NSAIDs), which are extremely toxic for all vultures and are the main cause of the serious population decline (by 99%) of three vulture species of the Gyps genus during the 1990s in India and whose population have still not recovered,' the organisation said." Quote: "The staff at the Overlook Apartments on Seabreeze Boulevard was cleaning the parking lot just before 8 a.m. when someone noticed the running vehicle in the back of the complex, near the dock along the river. The employees tried to wake the 25-year-old woman and 31-year-old man, but both were unconscious. McEvoy was pronounced dead at the hospital." Quote: "This is the second time in just over two weeks that a body has been found at the lake..."
Quote: "The Tigerair flight TT 511 from Brisbane to Melbourne landed safely around 10:05am after a pilot detected an 'unusual odour' in the cabin on descent. It was earlier believed smoke had filled the aircraft, but it was later confirmed there were only reports of an odd smell in the cabin." Quote: "No one was home at the time, but the driver did suffer injuries as he came barreling down the street. He claims his brakes failed before the 18-wheeler, carrying dirt ended up slamming into the house,which caused the spilling of some diesel fuel, fire officials said." Quote: "A Sydney building has partially collapsed and a gas leak has been detected, forcing people to flee from neighbouring properties. Fire and Rescue NSW said on Twitter that the vacant two-level building in a row of shops in Enfield collapsed late on Monday night, and about 40 people were evacuated from other building in the area. Police say the gas leak has been contained, and structural engineers are assessing the site." Quote: "The state of emergency will provide humanitarian help for the communities and assistance in the cleanup. In early February, President Ollanta Humala's government declared a health emergency in the region because the oil had polluted the rivers that provide drinking water to the affected districts. The spill was due to pipeline deterioration, environmental investigators said." Quote: "Neighbors say they heard explosions, but the cause of the fire is still under investigation." Quote: "Firefighters were called to Hirwaun industrial estate just before 05:15 GMT after pallets caught fire and flames spread to a nearby factory. At its height, seven fire engines were tackling the blaze." Quote: "A small plane crashed in Gainesville after reporting a fire in the cockpit Sunday afternoon, authorities said. Two people were injured in the crash and transported to a local hospital, according to the Gainesville Police Department. The crash occurred shortly after noon on the 1900 block of NE Waldo Road." 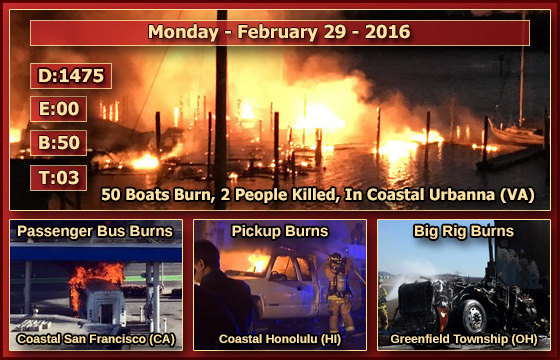 Quote: "A four alarm fire destroyed a boat storage facility containing at least 350 boats at Sundance Marina on Tomahawk Island Drive in Portland. Firefighters are still fighting the blaze, which was first reported at approximately 10:30 p.m. Sunday night." Quote: "Dennis DeHaas told KATU News there were between 350 to 400 boats of all sizes stored inside. All of those boats are total losses." Quote: "Much of the roof in the rear of the house was burned away. A small boat and a four-wheeler were left among the charred remains directly behind the house, in what appeared to have been a garage or carport." Quote: "The coastguard received a distress call about lunchtime that a yacht was on fire. People on other boats rescued those on the burning yacht, which included children." Quote: "A storage shed caught fire with ATVs, a lawn mower and a tractor inside. Fuel caused black smoke to rise from the fire." Quote: "Posted Feb. 28, 2016 at 11:21 AM / Updated Feb 28, 2016 at 11:25 AM / Ben Bolt Fire Department units are currently responding to a report of a recreational vehicle fire on US Highway 281 south of Ben Bolt." Quote: "A grass fire in Harrah has scorched 100 acres near Adam Road and Highway 62 on Sunday. Officials said the fire has burned several vehicles and buildings, and it's approaching some homes." Quote: "The multi-alarm fire engulfed a cabinet shop, a storage facility and a small church on the corner of Bragg and Matthews streets, officials said. All three buildings were considered a total loss. All the buildings were unoccupied when the fire started, officials said." Quote: "Minidoka County Sheriff’s Captain Dan Kindig said fishermen found the man’s body at a small campsite near the pond. Foul play is not suspected." Quote: "A light aircraft crashed at Gimpo International Airport in western Seoul, sources said Sunday, killing two on board after losing communication shortly after takeoff." Quote: "No charges have been filed at this time."